(Book). With clear and easy-to-understand exercises, The Piano Handbook is perfect for anyone interested in learning the piano or improving their skills. It provides fresh material and techniques in styles ranging from classical to jazz, rock, bebop and fusion, and gives new players everything they need to learn and enjoy the piano. This book's innovative tutorial approach covers classical and contemporary music styles in an integrated way, and the companion audio brings the playing techniques and concepts to life. A full-color photo gallery illustrates the history of the piano and its essential recordings. The book also includes access to audio downloads of selected examples and pieces. This hardcover, deluxe edition also features semi-concealed spiral binding so the book stays open on the piano. 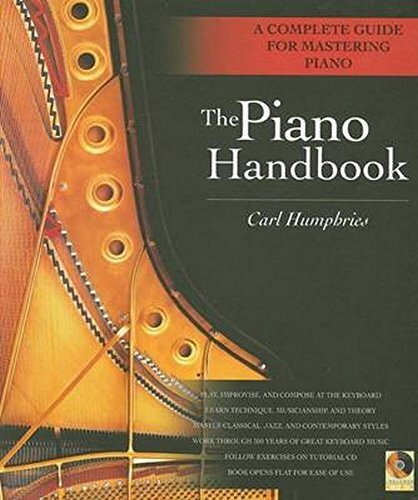 The Piano Handbook prepares you not just to play, but to perform and not just as a pianist, but as a complete musician. If you have any questions about this product by Brand: Backbeat Books 2003-02-01, contact us by completing and submitting the form below. If you are looking for a specif part number, please include it with your message.